Abstract: It is not lost on many Canadians that Nova Scotia has had a long and rather unique history with racism and has been perceived as being rather slow to address the structural and institutional implications of that history in Indigenous and African Nova Scotian communities. The province’s failure to acknowledge the complex and specific ways in which race is implicated in environmental policy making is, perhaps, not surprising to many. In this presentation, Dr. Ingrid Waldron will lay out the limits of the current environmental justice narrative in Nova Scotia - one that has largely failed to acknowledge how racism and other structural factors are implicated in the disproportionate location of polluting industries and other environmental hazards in Indigenous and African Nova Scotian communities. Using her Environmental Noxiousness, Racial Inequities & Community Health Project (ENRICH Project) as the basis to her discussion, Dr. Waldron will discuss how she has been using a collaborative multi-pronged, interdisciplinary, and intersectional approach to address environmental racism in Indigenous and African Nova Scotian communities. Biography: Dr. Ingrid Waldron is a sociologist, an Associate Professor in the School of Nursing at Dalhousie University and the Director of the Environmental Noxiousness, Racial Inequities & Community Health Project (The ENRICH Project). Her research focuses on the impacts of racism and other forms of discrimination on health and mental health in Black, Indigenous, and immigrant communities in Nova Scotia and Canada; Black women’s health and mental health; the racialization of psychiatric diagnoses; the impacts of gentrification and other structural determinants of health in the Black community in the North End of Halifax; intimate partner violence experienced by racially and culturally diverse women in mid-life; and protective factors for children’s welfare in African Nova Scotian, Indigenous, and immigrant communities. Dr. Waldron’s Environmental Noxiousness, Racial Inequities & Community Health Project (The ENRICH Project). 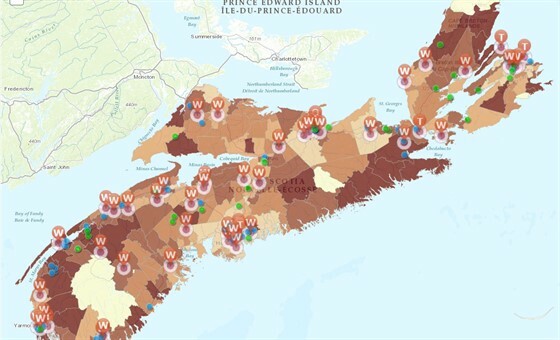 is investigating the social, economic, political and health effects of environmental racism in African Nova Scotian and Mi’kmaw communities. Dr. Waldron’s first book There’s Something in the Water: Environmental Racism in Indigenous and Black Communities will be released in April 2018 by Fernwood Publishing. Note: This lecture is being presented as part of Waterloo Global Science Initiative's Generation SDG Summit - an event focused on Canadian implementation of the UN Sustainable Development Goals. WGSI is an independent non-profit whose mission is to catalyze collection action on sustainability issues. WGSI was founded through a partnership between Perimeter Institute and the University of Waterloo, and while WGSI operates independently, the founding partners remain key collaborators in WGSI's mission. There will be a waiting line for last minute cancelled (or ‘no show’) seats on the night of the lecture. Doors open at 6:00 pm. Come to Perimeter and pick-up a waiting line chit at the Waiting Line sign. An announcement will be made near the Bistro at 6:45 pm if theatre seats are available. Note: you must arrive in person to be part of the waiting line and be in the Bistro when the waiting line announcement is made. Everyone who comes to Perimeter will be able to participate in the lecture. The public lecture will be shown on closed circuit television in the quiet of the Time Room for any members of the waiting line who are not able to get a theatre seat. Wordsworth Books will be onsite with copies of Dr. Waldron's book, There's Something in the Water, for sale. Dr. Waldron will be signing copies following the lecture. Enjoy the live webcast of this lecture from the comfort of your own home. Join us at 7:00 pm night of the lecture and be part of the ONLINE virtual audience.